About 10 years after leaving campus, at a 2004 pre-concert rooftop party in Denver, Colorado, Christian Dow and Trace Tyler met. 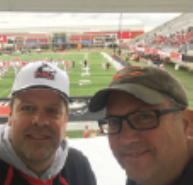 It was a shared enjoyment of Jimmy Buffett music that connected them, and a fast friendship formed between these two “Parrot Heads.” Since then, through numerous trips to NIU football games in DeKalb and across the country, they have forged a strong bond. Recently, they took their friendship to the next level by creating a shared scholarship in the School of Engineering. The scholarship awards students who need a little financial boost to cross the finish line to graduate. Alumni Trace Tyler (left) and Christian Dow teamed up to support future NIU students. For Christian and Trace, it was only the start: Trace is establishing an endowed scholarship at the School of Law, and Christian is now exploring how he can expand his support to the College of Engineering Mechatronics program. These men, who worked to put themselves through college, appreciate how financial support can significantly impact a student’s journey. Both relocated to Colorado shortly after earning degrees from NIU. That was in 1995 for Christian, who is president of Panther Industries in Highlands Ranch, Colorado. Two years later, Trace moved to the Centennial State, pursuing a career in law, estate planning, and other financial services that has led to his current status as owner of two American Family Insurance agencies near Vail, Colorado. Christian’s company, a manufacturer of automated labeling machinery, has developed a relationship with STEM School Highlands Ranch to help students develop the skills vital to a manufacturing career. That partnership has created a program enabling students to earn an associate degree in Mechatronics concurrently with their high school diploma. The experience sparked Christian’s interest in helping NIU students. He had already committed financial support to the university through his estate but felt a tug to do something more—and more immediately. Trace cites his parents, Jan and Dewey, as major influences in modeling generosity. A decade ago, he began donating to scholarship funds at his Lutheran grade and high schools. In fall 2017, he mentioned the idea of supporting NIU students to Christian. His friend “jumped on board” right away, Trace recalls. You can make a difference for NIU students through the NIU Foundation. Make your gift today and help ensure tomorrow’s success.